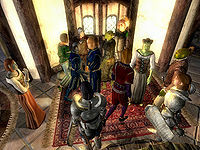 Ohtimbar is an Altmer nightblade and a member of the Cheydinhal Fighters Guild. He was once an accomplished Arena fighter, but left in favor of the less dangerous work at the Fighters Guild. Ohtimbar is one of the few Fighters Guild members who owns a house in town. It is located right next to Riverview and he wakes up there every morning at 6am and spends the next two hours strolling around inside. At 8am he heads for the Guild, but on the way, he pays a quick visit to the Great Chapel of Arkay and receives a blessing from Zenithar. 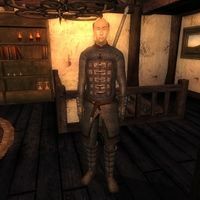 He spends two hours at the Guild before leaving at 10am, when he heads for Borba's Goods and Stores, where he hangs out and talks with the other customers. He heads for the Cheydinhal Bridge Inn at noon and will, due to his low responsibility, never think twice about stealing his lunch from the pockets of innkeeper Mariana Ancharia. At 2pm he returns to the guildhall for a bit of wandering until he enjoys a two-hour dinner at 6pm. He leaves at 8pm, goes back to his house and spends the rest of the evening there until his bedtime at midnight. On Loredas, he will break off his schedule and attend the exclusive party held by Voranil at Riverview. The party starts at 6pm, and lasts until midnight. Ohtimbar will be there the whole time and will eat a luxury dinner with the other guests for two hours at 8pm. He wields a silver battle axe and wears an almost complete set of chainmail armor, including boots, cuirass, gauntlets, and greaves. He carries around his house key and a small amount of gold. Ohtimbar knows a leveled set of nightblade spells, as well as one extra major Alteration spell. When approached for the first time, he will introduce himself and tell you about his past: "Ohtimbar, Fighters Guild Guardian. Maybe you saw me in the Arena, couple of years ago? I was a contender. I got out while I still had the original set of legs, arms, and eyes. Fighters Guild is a perfect place for me now." If you ask him about Cheydinhal, he will expand on his Arena experiences: "I worked the Arena in the Imperial City for a while. Got up to Gladiator, then took a powder. A guy could get hurt, you know." Burz gro-Khash, head of the Cheydinhal Fighters Guild, is not impressed by the Guardian rank of either Ohtimbar or his fellow guild mate, Keld of the Isles. Burz will tell you, "This guild is going to hell in a hogcart. Look at what they give me? Keld of the Isles? Ohtimbar? Both Guardian rank? Phah! Useless." This page was last modified on 2 June 2016, at 18:21.